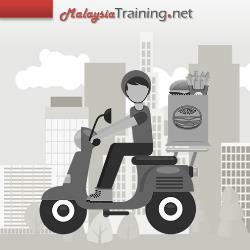 This program is designed for all motorcyclists, especially despatch riders. Today's working environment has changed a lot and become more challenging. Employment is demanding for excellent and superb performance, productivity, efficiency not only on machinery but also the human capital. Thus developing human capital competency has become vital activities at workplace with emphasis given on developing productive team work. Therefore, training related to defensive driving or safety whilst driving has emerge as important program. With such programs, employer may look forwad to have an improvement in their productivity, quality and services rendered to its customers. Moreover, by quality service rendered, employer may sustain its valuable customer and improve its financial performance. To learn 7 characteristics of excellent motorcyclist whom able to ensure vehicle life spent can be extended and generate more revenue. To enhance despatch rider competency in handling company motorcycle as well as interaction with customer in order to delight all customers. To learn despatch rider’ roles and responsibilities before, during and after driving company vehicle in order to reduce operational cost. To enhance etiquette in handling customers and managing complaint in order to sustain customers and gain respect from them.